Posted on June 17, 2012, 11:59 pm, by anna, under Animals, Snail. Recently I discovered that there are people who climb up cliffs which are so extremely massive that they have to sleep hanging off the cliff-face in a tent. A terrifying prospect if ever I heard one, and one that requires some seriously specialist equipment. Yet just around the corner from my home I find this humble snail, performing a similar trick all by itself, having been born fully equipped to tackle such a feat. This snail has probably travelled up the tree to rest for a while. When its surrounding world is too hot or dry or windy, or if food supplies are low, a snail will often climb up and away from the heat of the earth, seal its entrance, stick itself tight, and enter a kind of dormancy called estivation. Slime is the key. That white section by which this little snail is attached to its tree is truly amazing stuff. In fact it’s so important that a snail expends nearly one-third of its energy manufacturing it, and it doesn’t just use one blanket recipe for all its slime, but tailors the recipe depending on the occasion. 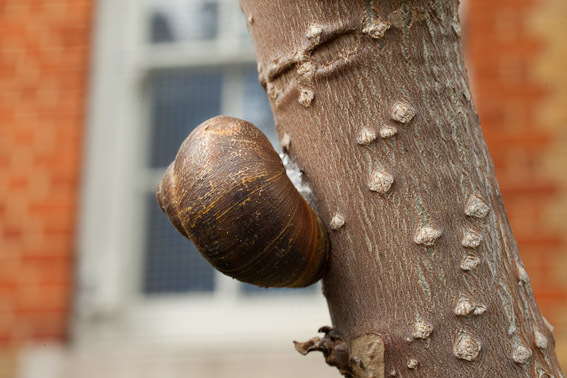 This snail has used slime to climb the tree. It is currently using slime to stick to the tree and to seal its entrance. It uses slime to keep itself moist on an ongoing basis. At other times in its life it will use slime for courting, mating and egg production, and possibly for healing, depending on any accidents that might befall it. So, lets imagine a future accident does befall it. One dark night it’s making its way across the pavement, when squish! Disaster! Luckily the offending human was not only not wearing headphones, but possessed a pair of sensitive ears which picked up on the beginnings of a crunch, at which point their foot recoiled, leaving our snail with a cracked shell but untouched insides. Can a snail survive such a thing? Amazingly, yes! The slime it produces at such times is packed with antioxidants and other regenerative substances. In fact, for these reasons, snail slime is becoming a popular ingredient in anti-ageing creams. And now for something more practical. If you happen to experience an event like the one described above, and would like to help the snail you’ve accidentally damaged on its road to recovery, here are some tips on how to go about rescuing it. Wonderful post, Anna. I’ve linked it directly from my blog. Hi Anna, Loving the post. I was tweeting recently (@wellywomanblog) about the stickiness of slug slime and how it is so difficult to get rid of and how science really should find a use for it. I’m not keen on the idea of rubbing snail slime on my face not directly anyway. In a little pot, smelling of roses then maybe and if it could do something about the wrinkles I’ve started to discover then how amazing would that be? Yes it does sound rather gross doesn’t it, but apparently it’s all the rage these days in the moisturising industry! Apparently the skin benefits were discovered by Chilean snail farmers. Whilst farming snails for food, they noticed their hands becoming really smooth, and their cuts healing extra fast. Hmmm, I might try wearing a snail instead of a plaster next time I cut myself… Anyway, if you don’t fancy putting snail slime directly on your face, check out this comparison of all the different snail creams available!